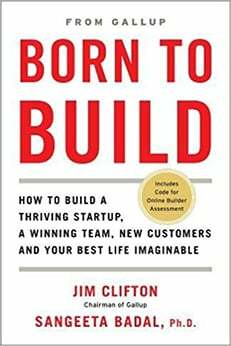 Business RSS News: Book Asks if You Are Born to Build? Gathering resources for your business is never easy. It takes savvy, insight, and timing to make those resources work in your favor. It also requires you know how to build alliances and gather resources well. One book aspiring to look at this process more closely is Born to Build: How to Build a Thriving Startup, a Winning Team, New Customers, and Your Best Life Imaginable. The book’s authors are Jim Clifton, chairman of Gallop, and Sangeeta Badal, Ph.D., principal scientist for the Gallup Builder Initiative. Clifton and Badal have written a useful guide for entrepreneurs seeking a balanced approach to building their business in the face of fierce competition. What Is Born to Build About? Born to Build addresses the mindset entrepreneurs typically bring to their strategic choices. The authors believe most people overlook the builder aspect of creating a business, and as a result overlook vital concepts for better managing their opportunities and resources. The authors follow up in part three of the book by detailing 10 talents of successful builders, so readers wishing to build a business understand what talents are needed and where to apply them. The book also contains Gallup Builder Profile 10, a process for assessing entrepreneurial capabilities. Readers can take an online assessment based on this profile. The assessment vets readers’ innate talents, allowing them to do a “SWOT” analysis to determine their ability to build the businesses they desire. The last section of the book explains the research used to develop the assessment. Clifton and Badal translate experiences from larger industries to speak to the anxieties and concerns of entrepreneurs with small scale businesses. They show how those experiences transcend professions. For example, the authors show how lessons learned from the successes of actor John Leguizamo and financial brokerage firm Charles Schwab can both be used by builders seeking to create a profitable business. “There are many stories of highly successful builders who not only were the first to recognize opportunities in their environment, but in many cases, they outright created new opportunities for themselves….You are not alone if you’re asking yourself – Do I have what it takes to build? What should I build? Where do I begin? Whom do I ask for help?” the authors write. It’s a wonderful perspective because it helps small business owners who aspire to scale but feel excluded from many discussions on aggressive growth because they are not the next Uber. At the same time Clifton and Badal speak to those whose ambitions are to be the next Uber too. There’s also a section of the book on risk and how entrepreneurs can use a process called hyper-core self evaluation to avoid taking on too much. Venture capitalists examine entrepreneur motives to see if they are truly building more than just a product to sell. Reading Born to Build will show you the right mindset for dealing with investors and, more importantly, offers ways to examine your competitive readiness in building your business.